Take a left out of the parking lot (it’s a small commuter airport) and go 3-4 miles until you reach a stop sign and take a right on Route 12 (towards Salisbury). After a few miles, you should see signs for US Route 13 and an overpass (it’s the only one on this road). Take US Route 13 South (towards Norfolk). Keep on this route and you will hit the Virginia State Line in approximately 45 miles. Go about another 3-4 miles to the first stop light in Virginia (the Pizza Hut is a good landmark at this intersection). Take a left at this light. This road is Route 175 (to Chincoteague). Go about 5 miles and you will come to the intersection with Atlantic Rd (Ocean Deli and Royal Farms gas station are at this intersection). Take a left on Atlantic Rd. and follow it to the NASA Wallops Main Gate. If you are driving from Norfolk, you will need to take Route 13 North. Approximately 60 miles after getting off the Chesapeake Bay Bridge Tunnel, you will come to the intersection of Route 13 and Route 175 (the Pizza Hut is a good landmark at this intersection). You will need to take a right turn here. Go about 5 miles and you will come to the intersection with Atlantic Rd. (Ocean Deli and Royal Farms gas station are at this intersection). Take a left on Atlantic Rd and follow it to the NASA Wallops Main Gate. Exit the airport by taking I-195 W. Take exit 2A to merge onto MD-295 N/Baltimore-Washington Pkwy toward I-695 N/Baltimore. After 2.5 miles, take the exit onto I-695 E. After about 3 miles, take exit 2 to merge onto MD-10 S toward Severna Park. After another 7 miles, turn left onto MD-2 S/Ritchie Hwy. After about 8 miles, keep left at the fork, follow signs for US-301 N/US-50 E/Bay Bridge and merge onto US-301 N/US-50 E. Around Salisbury, MD, US-50 E will turn into US-13 S. Continue on US-13 S until you hit the intersection with Route 175 (the Pizza Hut is a good landmark at this intersection). Take a left at this light. This road is Route 175 (to Chincoteague). Go about 5 miles and you will come to the intersection with Atlantic Rd (Ocean Deli and Royal Farms gas station are at this intersection). Take a left on Atlantic Rd. and follow it to the NASA Wallops Main Gate. 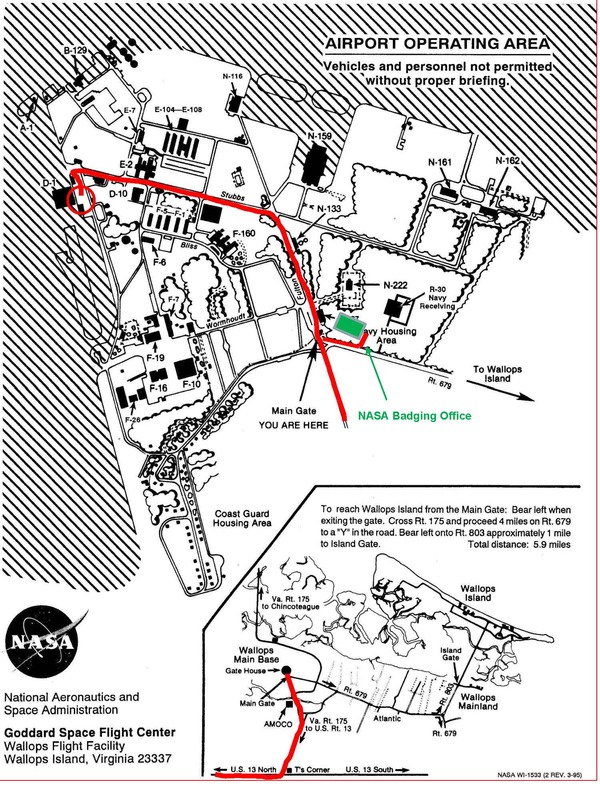 Persons without NASA PIV badges need to proceed to the NASA Wallops Main Gate as described above. On the right toward the end of the road, you'll see the Visitor Badging building. Sign in at the front desk to receive your local WFF Visitor badge. HS3 flight operations will be based at the D-1 hangar. Once through the WFF main gate, proceed on Fulton St, make a left on Stubbs Blvd and then a left on Rehor Rd. The D-1 hangar will be on your right.